Infiniti Q50 Sport and Hybrid Strut Bar! Infiniti Q60 exhaust component compatibility. A Quick Tip For Tower Bars With Adjustable Preload. SSR Wheels, how much do they weigh and how do lighter wheels benefit my car? Fake or Real… can you tell the difference? 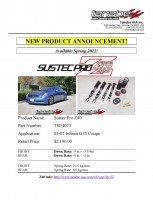 Customize your coilovers with Tanabe Pro210 springs! Big brake kit clear my wheels? How to measure wheel width. How to measure wheel offset. Did you see us at Imports@UCI? New Kazama Auto Shift Knob & Spin Turn Knob Set!